Model T Ford Forum: Totally OT: What are these? Totally OT: What are these? Model T Ford Forum: Forum 2014: Totally OT: What are these? I've seen parts like this in gas heaters all my life, but never learned what they're called. I'd like to replace a couple of broken ones. What name should I be looking for? ceramic plates "firebrick" for radiant heaters. Cant make 'em? 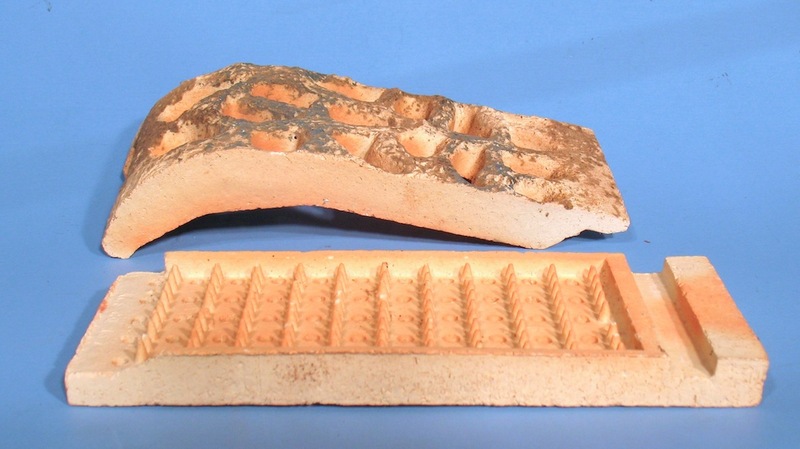 Pick up a bag of firebrick pre-mix (gunnite) and make a disposable clay mold. Might have to bake them in a kiln. We called them radiants growing up. We broke some and had a hard time finding any. We finally found some from a junk heater and used those. Hadn't thought about them for years since you mentioned them. We grew up using propane heaters here in the country. My older sister who lives in the home place house still uses 2 of them. The 150 gal propane tank that my parents bought back in the late 40's is still in use today. The post about the Ebay link is using a tag that's 'vintage'. Come to think of it they may be for some people. I've never thought about it until now. I'm an old gas man, if these happen to be obsolete from an old heater you may have an issue finding them for your heater... Back 25 years ago they used to make a glue to repair these if you had a cracked one. You might check a natural gas dealer to see if they still make the cement to fix them with... Don't think Lowes or Home Depot would carry it. Steve check out ebay item # 221632401402. Steve, just sitting here and thinking about it I haven't seen gas room heaters in a long time in stores. Maybe I just missed them but central heat changed a lot of things. I can remember seeing want ads of folks looking for space heaters in the local thrift nickel paper in this area. My Mother was always careful with us kids lighting heaters on cold mornings! Some of these, if the gas went out while the stove was on and then later the gas came back on, would leak gas out into the room unless you had thought to shut off the valve when the gas went out. Probably the best reason they are no longer available. I know a certain valve can prevent this, but I've heard lots were made without that certain type of valve. Having said that, they sure did heat up our living room when I was a kid. We called them radiants, too. When I was a teenager, I worked in a hardware store. We sold replacement radiants. There were many different styles and sizes and sometimes the size that fit wouldn't have the same appearance, but would do the job if the customer didn't care what it looked like. The store manager would also buy up old used space heaters and it would be my job to clean them up and paint them and replace any broken or missing radiants before putting them out for sale each Fall. We would also sell orifices for heaters. We had a special set of drill bits that were turned by hand to drill out the orifice to the proper size for the specified BTU's for either propane or natural gas. There was a chart that told you which bit to use for any given BTU of each type gas. If you look on their heater radiants page, they have a list which they say represents only a small sample of their inventory. If you know the make and model of your space heater, they may be able to help you out. The first item at heaterradiants.com is cement. After seeing some of the prices of replacement pieces, I think I'll go with the cement. Scott, these are found in both vented and unvented heaters. It's the unvented ones that are dangerous. I have always been under the impression that the older houses were just not built as air tight as they are today, so the CO wasn't ever a problem back then. My grandmother used these gas heaters for years with no problem, but her house had single pane windows with no weather stripping and doors with no weather stripping and a crack at the bottom so big she would roll up a towel to lay across the floor up against the door to try to reduce the draft. I would not use one today in a modern home. At least not without a CO monitor. I have a set of ventless gas logs in my living room. They are supposed to be safe to use, but I don't use them while we are asleep and I do have a CO monitor in the room. It has never gone off, but I still feel better with it there. Another memory I have of my grandmother's house was that she would always have a tin can full of water sitting on the space heaters to "Keep the room from getting dried out". I don't know if it really did any good, but it certainly did no harm. A lot of those heaters my old boss man would buy to resale had evidence of a tin can having sat on them, as well. Must have been a common practice. Most everybody used these types of heaters way back when. Are they safe? Depends how safe you were using them. We didn't think to much about the question of safety and we made it. They kept us warm and we were happy. I do remember the stoves had a UL approved tag on them. Would they be today? I'm thinking you would have to have them vented to the outside today. Not sure about that one. A lot of wood stoves and gas heaters had cans attached to the back as "humidifiers". That was the same era when you saw chains dragging on the road from truck axles to drain off static electricity. I don't know if either really did anything. Everyone around here who lives "in the woods" (and a lot of folks in town) heats with wood stoves. Pretty much all of them have a container of water on the stove to add humidity to the air. Yes, it does work. We have a humidifier but we use alot less water burning corn.It's strange to be away from home and notice the temp change in cycles with gas or fuel! Bud. Steve Long, the old ones were dangerous as they had no safety devices, the new vent free models have an oxygen depletion sensor as well as a thermocouple the ods will shut the unit off if the room oxygen drops below 20% or if the gas is interrupted the thermocouple won't allow the gas to flow and as they are 99% efficient CO is not a problem, i have one that heats my garage, it is mounted about 6.5 ft above the floor and has a fan, it will keep my garage 60 Deg with no problem, they are legal in all states except CA. What we will do with the gas logs is turn the heat pump off and the unit fan on, and let it recirculate the hot air from the living room where the logs are to the rest of the house.